A family of Lancashire entrepreneurs, Thomas and Anne Lomax bought Bodfach Hall in Llanfyllin in 1854. Their two children John and Anne were to have a big influence in the affairs of Llanfyllin. John's Coming of Age was a significant local event. THE COMING-OF-AGE OF MR. JOHN LOMAX. It was quite in the natural order of things that the entrance upon manhood of the eldest son and heir of a much-beloved and popular country squire should be celebrated with popular rejoicings, and the high esteem in which Mrs Lomax of Bodfach, and her late husband, Mr. T. O. Lomax, are held, was abundantly testified by the general character of the rejoicings which took place at Bodfach and Llanfyllin on Thursday to commemorate the attainment of his majority by their eldest son, Mr. John Lomax. For some time past a far-reaching and active committee has been engaged in making due provision for the celebration of the event, and in every respect their efforts were most completely satisfactory. They did not, however, take the meteorological authorities into their confidence, and early-risers on Thursday - and all who proposed to take any part in the demonstrations were of necessity early astir - discovered to their horror that the weather, by reason of the deep snow which covered the face of the earth, was such as might have been appropriate in mid-winter. But depressing as the state of the elements was it had no material effect upon the good spirits of those who were pre-determined to give due éclat to the proceedings of the day, and not an item in the long programme, which was evidently drawn up in fair weather, was foregone. As the morning advanced the snow was replaced by rain, at mid-day the hills were covered with a delicate veil of gossamer, but as the afternoon advanced all traces of the snow disappeared, and the rain came only at intervals and with decreasing energy. He became a distinguished local figure, involved in many aspects of local affairs, whose motto was "Service before self". He was renowned as a good landlord. Both he and his sister were involved in the running of the local school and of the Llanfyllin show. However in spite of their community involvement they were a quiet family who spent much time at Bodfach with their beloved horses and dogs. The photograph below shows Anne with her cousin Laura Pughe. 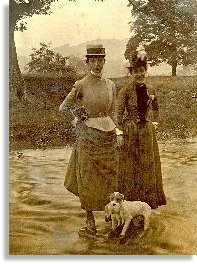 The Pughes were from the mother's side of the family and themselves became prominent local figures in Llanfyllin. They were keen on theatricals and pageants and the family's photographs have many examples of these occasions. 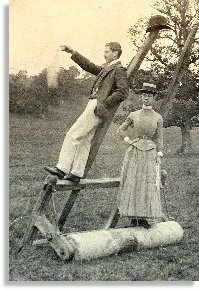 Anne herself was keen on photography and may have been the first person in Llanfyllin to possess a roll film camera. Neither of the children ever married. They lived with their mother until her death, and after John died in 1936 Anne inherited the house where she lived until her death in 1944. The 1891 census shows a small household, Mrs Lomax not being at home on census day.